Use the following links to access relevant information you may want but dates and details are shown below. ALL Black and Brown belts are invited to attend. 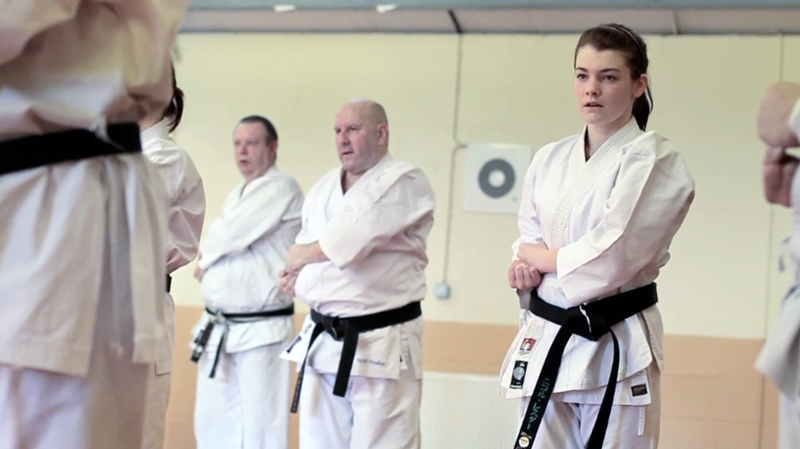 The course is aimed at attaining your DAN grade whether it is Shodan, Nidan or above. The cost for the course is £10. Start at 11am finish at 3pm. Instructional Course on JKAE England Tournament Refereeing Standards and Practice. If you have been a full 1st kyu for 6 months or more; have attended at least two National / International Courses - one of which must have been in the previous 12 months and wish to take your Shodan Grading on Sunday 24th February 2019 at the National Course in Basildon, then you need to attend the Shodan Assessment which is being held before and after the regular class on the above date. Please let me know beforehand if you wish to attend. Failure to do so may result in you being the only person at the assessment! 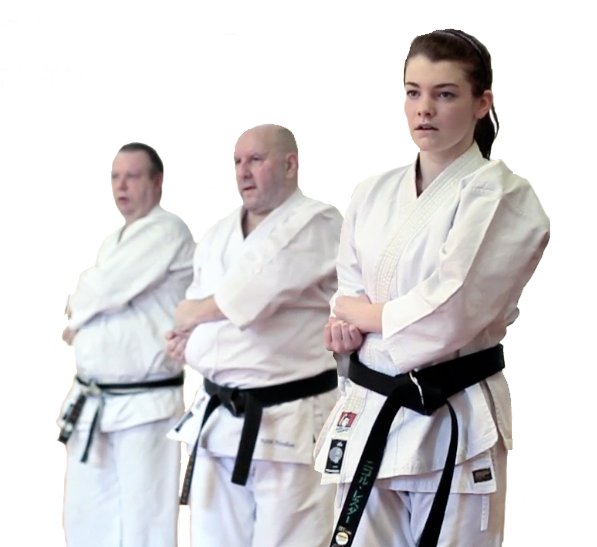 This is a JKA England run course for Students aged 14yrs to 17yrs. 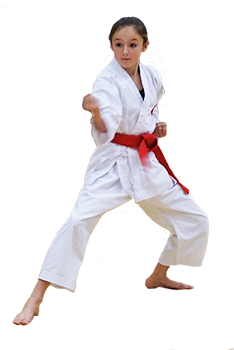 the course will give them an opportunity to have an insight as to what it is to be a JKA England Instructor and acquire the qualification to be a Junior assistant Instructor. The grading will be in one session. Please submit your Grading Request Form on or before 14th March. Please ensure your licence will be current on the day of the grading otherwise you will not be eligible to grade. If you need to renew your licence, let me have your licence fee ASAP. Those students who are on a temporary grade will have to retake their previous grading again. To check, look at your last grading in your licence book. If you have any questions, please ask. Please check out the KYU GRADING INFO for more information. You can submit your licence and grading fee anytime including the day of the grading. If you have been a full 1st kyu for 6 months or more; have attended at least two National / International Courses - one of which must have been in the previous 12 months and wish to take your Shodan Grading on Sunday 5th May 2019 at the International Course in Crawley, then you need to attend the Shodan Assessment which is being held before and after the regular class on the above date. Please let me know beforehand if you wish to attend. Book HERE! Failure to do so may result in you being the only person at the assessment! The Course is 5pm - 8pm on the Friday and 11am - 2pm on Saturday, Sunday and Monday. 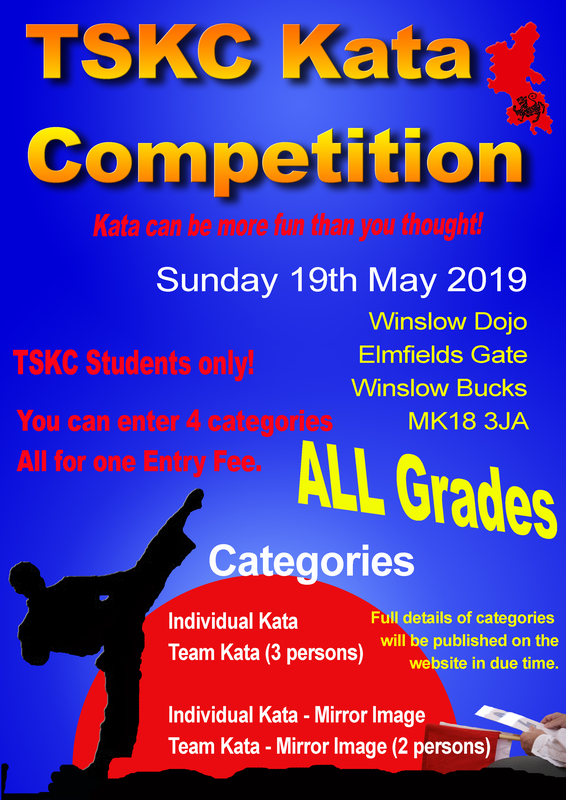 TSKC will be holding their first Kata Competition at the Winslow Dojo on Sunday, 14th October 2018 at 10am. There will be four categories each student can enter: two individual and two team. Two of the categories will be Mirror Image. In order for this to be a success, EVERYONE will be entered into the competition. Start finding your partners for Team categories - NOW! There will be 3 person mixed Team kata and a 2 person mixed Mirror Image Team kata. Details of the Categories and Rules. Saturday morning training at Bierton with a guest Instructor. I have enlisted the assistance of another JKA England Instructor to attend our dojo and deliver a class for you. In return, I would like you to attend and support this event and show some respect to the Instructor. If you only attend once a week and it's not usually a Saturday, do not fear this lesson is FREE, it does not count on your lesson plan so make the effort to attend. Please submit your Grading Request Form on or before 6th June. Please ensure your licence will be current on the day of the grading otherwise you will not be eligible to grade. If you need to renew your licence, let me have your licence fee ASAP. ALL grades from 9th Kyu upwards. White belts may compete but MUST perform Heian Shodan in Kata eliminations. Please seriously consider participating in this upcoming JKA England competition. There will be Team events so get together and practice. List of participants can be seen by clicking the appropriate link below. £12 Entry Fee for one event; £20 for two. Team events are £20 per team. You must hold a valid current licence. Spectators will be welcome. NB: volunteers for Referees, Judges, Timekeepers, & general helpers will be very welcome! You do not need any previous experience to perform as Timekeeper or General helper. It's a great day out! For information on the Categories; Rules and what you will need, click on the relevant links nearer the date. For information on the Categories; Rules and what you will need click on the relevant links when available. Click here and complete to compete! If you have been a full 1st kyu for 6 months or more; have attended at least two National / International Courses - one of which must have been in the previous 12 months and wish to take your Shodan Grading on Sunday 30th September 2018 at the National Course in Hatfield, then you need to attend the Shodan Assessment which is being held before and after the regular class on the above date. Please submit your Grading Request Form on or before 7th September. Please ensure your licence will be current on the day of the grading otherwise you will not be eligible to grade. If you need to renew your licence, let me have your licence fee ASAP. Attendee criteria to be confirmed. The course starts at 10am and will finish at 1pm. The venue is yet to be confirmed. Watch this space. 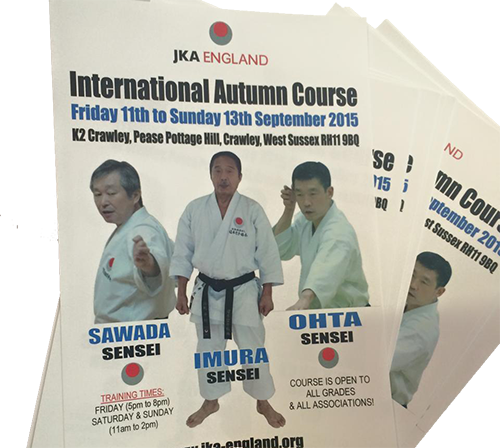 This is a JKA England course but is not classed as a National course for Shodan purposes. As it is a Regional Course, students from Reading, Stevenage, Oxford, Hertfordshire and Berkshire amongst others, will also be attending. Numbers are limited! If you have been a full 1st kyu for 6 months or more; have attended at least two National / International Courses - one of which must have been in the previous 12 months and wish to take your Shodan Grading on Sunday 3rd November 2019 at the International Course at the K2, then you need to attend the Shodan Assessment which is being held before and after the regular class on the above date. ALL grades from 9th Kyu upwards. White belts may compete but MUST perform Heian Shodan in Kata eliminations. Please seriously consider participating in this upcoming JKA England competition. There will be NO Team events. £12 Entry Fee for one event; £20 for two. Must hold a valid current licence. Spectators will be welcome. NB: volunteers for Referees, Judges, Timekeepers, & general helpers will be very welcome! You do not need any previous experience to perform as Timekeeper or General helper. It's a great day out! For information on the Categories; Rules and what you will need click on the relevant links. Please submit your Grading Request Form on or before 13th December. Please ensure your licence will be current on the day of the grading otherwise you will not be eligible to grade. If you need to renew your licence, let me have your licence fee ASAP. Black & Brown Belt course in Winslow. JKA England National course in Newark inc DAN Grading. Full details of courses can be found by clicking the appropriate link in the Events calendar list.